Hot Reads: What's the Huskers' Biggest Recruiting Need? We’re a little more than a week away from the December sining period for football. Based on yesterday, you have to wonder how much different Nebraska’s class might look by then. The first big bit of recruiting news to hit Sunday was the decommitment of 4-star wide receiver Joshua Moore‍. Moore, who wrote a diary for Hail Varsity this season, was the top-rated player in the class, but you almost have to assume these sort of changes are coming following a coaching change, particularly with highly coveted prospects. If you found yourself asking “how is Mike Riley doing it?” as the Huskers landed commitments from top-ranked prospects, those same prospects’ slow defection provides the answers – relationships. When those relationships are severed, it’s hard to blame prospects for reconsidering what’s best for them. So how much different might Nebraska’s class next week when recruits can begin making it official? There’s probably at least one more defection from a “Riley recruit” likely to come, but there also seems to be a core group of commits who are going stick with Nebraska. We also got our first glimpse of what’s to come under Scott Frost and company. 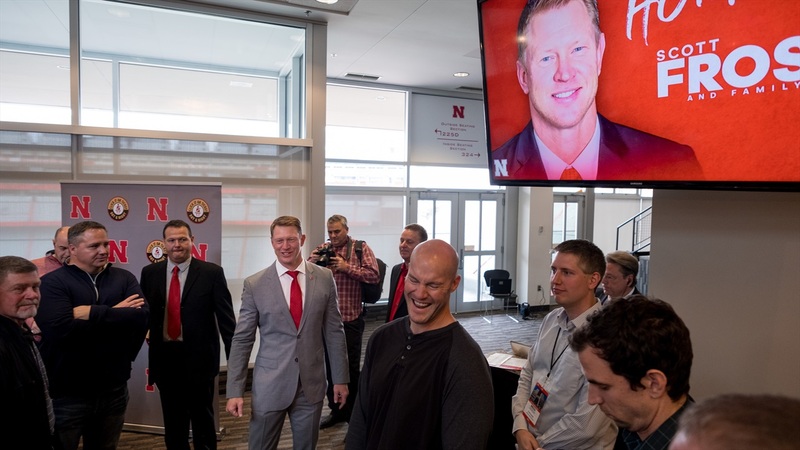 After hosting recruits on campus for the first time in Lincoln under this staff, the Huskers landed their first two commits of the Frost era on Sunday. CJ Smith‍, a 4-star (90.6) safety from Florida, was the first to pull the trigger. Nebraska needs defensive backs. He’s the only one in the class at this point, but he’s got the second-highest rating of the group so far. Not a bad way to get the ball rolling. Things are changing quickly on the recruiting front, but if you had to assess Nebraska’s biggest need right now in the 2018 class, what are you picking? You can let us know in our latest poll. After detouring through Kentucky to beat the Wildcats, Nebraska volleyball is headed to Kansas City Tuesday night and will face Penn State in the Final Four on Thursday at 6 p.m. CT.
We’ll have plenty of volleyball coverage throughout the week so check back often. ESPN went deep on the relationship between Adidas and Louisville. Very interesting read. CFP executive director Bill Hancock explains why he thinks the selection committee is better than the BCS. VolleyballMag.com previews the Final Four. Looks like Sonny Dykes will be the next head coach at SMU.